1. Black Tap (529 Broome St, New York, NY 10013): This restaurant is the cream of the crop when it comes to the perfect milkshake, so end your date night the right way by stopping at Black Tap on Broome Street! Thankfully, you don’t have to worry about cutting your night short in order to indulge in their artfully designed milkshakes. Black Tap is open until 12:00 AM during weekdays and are also open until 1:00 AM Thursday through Saturday. These $15, foot-tall milkshakes launched this past November and have spread like wildfire over social media. One of their fan favorite milkshakes include the Sweet N’ Salty Peanut Butter Shake: chocolate frosted rim with chocolate gems and PB cups topped with a sugar daddy, pretzel rods, chocolate covered pretzel, whipped cream and chocolate drizzle – what else could you ever want in a milkshake? So, if you and your boo are ever in the New York area, make sure to check out this Insta-famous eatery! 2. Sugar Factory (835 Washington St, New York, NY 10014): In case you miss Black Tap’s 1:00 AM weekend cut off point, don’t fret! The Sugar Factory, located on Washington Street, is open weeknights until 1:00 AM and 2:00 AM on weekends. The Sugar Factory prides themselves on their delicious sweets in and on their shakes. Celebrities such as Kylie Jenner, who appeared at the chains Ocean Drive opening, can’t seem to get enough! Although the Sugar Factory has dessert options such as their $99 King King, which includes 24 scoops of ice cream, and their $1,000 chocolate fondue served with a bottle of Dom Perignon, you don’t have to spend a fortune to get a great shake. Their most popular $20 shake called the Caramel Sugar Daddy Cheesecake milkshake serves your typical vanilla milkshake in a mug coated with chocolate icing drizzled with caramel sauce and whipped cream. You thought that was the last of it? The shake also comes with a huge slice of cheesecake paired with their famous rainbow lollipop right on top. Get your fix by visiting the Sugar Factory! 3. 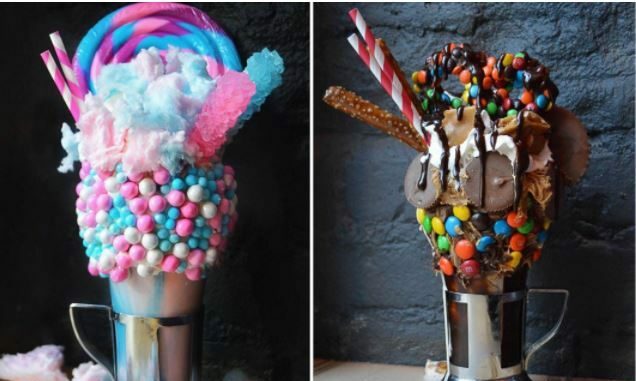 Buns Bar (263 W 19th St, New York, NY 10011): This restaurant known specifically for their decorated milkshakes is the perfect date idea for you and your love if you’re looking to be a bit nostalgic during your date night. Buns Bar located on West 19th Street decorates their milkshakes with everyones favorite childhood characters such as SpongeBob, the Teenage Mutant Ninja Turtles, and Spiderman. Anything you can think of, they make it! After coating their glasses with thick layers of icing, the artists at Buns Bar carefully place sprinkles, marshmallows, and cereal on the outside of the glass to create your favorite characters. Looking for something a bit more “adult”? No worries – Buns Bar lives up to their name. You can order some of their famous milkshakes with a splash (or more) or your favorite liquor! People are obsessed with their famous Cinnabon Milkshake. Typically priced at $15 dollars a shake, for an extra $5 you can add shots of RumChata liqueur to enhance the savory Cinnabon shake. Keep your night going by checking out Buns Bar! Are you from the New York area and know other places to find over the top milkshakes? Share some of your favorites with us by commenting below!